BD: Before we talk about the tour let’s flip back time and remind our readers about the album Black Magic. What was the inspiration behind the title for this heavy blues album. We said – This is a great album for blues, rock and blues/rock enthusiasts and should cement Jared’s reputation as a guitarist of rare skills – the album is crafted with guitar style and the tracks are all under 3.5 minutes. Short and very sweet do you not have the patience for long guitar solos or is this short track approach reflect your love of jamming? JJN: When I recorded Oh Glory, I was just starting finding out who I was as an artist who loved playing Oh Glory. Black Magic has no fat, no fillers harken back to ‘less is more’. Written in snapshots during sound checks, on the road a little lick of a song was on board. Recorded in Johnny Depp’s studio doing the vocals when I had a day off on tour. I had two days at home so let’s record the vocals. The vibe gives a raw straight up feel. It is a cool feel about it different to Oh Glory. I feel it is the last thing to be the same on a record. I love the way Cream and Allman Brothers create a live sound I want to do the same thing people hear it for the first time now hear it again and anyone can dig it. Black Magic is short leaving the listener wanting more. People are listening which is kinda cool when they see us. It is in the old school single format as we didn’t want to waste any time. It is super jamming and being experimental. Will be happy in its own Black Magic little world with a lot of energy in live shows. It is unrealistic that the sound and feel is the same at live shows and in the studio. Feel it is a disservice to the fans if create a sound in the studio that does not transcend onto the stage. Live shows equal performance. A lot of artists are not taking risks if the live show isn’t different you might as well stay at home and listen to the record, as they already know what they will get. It is important to keep putting all your heart into the music. No one jams it is a lost art and needs to be kept alive. BD: You thrilled the crowds when you played at Steelhouse and when earlier this year you were special guest on Stone Broken’s Tour. Both shows were a spectacular display of the power of a trio and firework playing on your trusted six strings. The Stone Broken show had an added surprise, Bernie Marsden joining you on stage for a wonderful showcase of the power of a blues jam that rocked. How did it feel playing with Bernie? BD: You are back touring the UK, what is the attraction to touring the country as you have played from large festivals including Ramblin’ Man, a variety of venues including small pubs. Does the venue impact on the way you play and the tracks you choose? Impacts the volume we play, can push it up if playing outdoors otherwise not have the impact and the crowds not get the full experience. It is important to play differently reflecting the venue. You have the intimate factor at super small venues it is a different level of experience. When touring with Skynard touring and playing arenas it was good but the audience is so far away. It was awesome playing but it is also when they are only a table away from where you are playing. That is why I am happy to play at small venues very intimate and people love the music there is a connection. BD: This time you are on tour with L.A.Guns, and your own shows seven nights in seven towns and cities, over eight nights, quite a hectic schedule and a few miles travel the highways and byways to get to the next show? Other than your guitar what are your travel essentials to keep you relaxed and sane? JNN: Coffee good coffee. I do try and do more to keep myself healthy. I am conscious of what I eat. Not eat late at night like an athlete thing with travelling so much, you cannot give the best performance when you feel like you have a bad hangover never going to play the best show. So travel essentials Caffeine and a good place to shop for food. UK that can be any road services with outlets like M&S you get good food that is what I love about the UK. I am sick of eating fast food, doesn’t make you feel good. BD: I Saw in your Facebook feed that you are shooting a music video, Does this mean that you have a new album in the pipeline and if so will we be hearing new music from your six-string when touring with L.A.Guns? JNN: The music video new single for Black Magic new single from the album. New music playing new songs feeling them out, ready to make songs in the studio. The songs get their own life playing to an audience the reason for lots of jams, lots of shows. BD: Every day I see posts of you playing music, do you ever stop playing. What do you do to relax? JJN: One thing I don’t have an obsession it is positive if I don’t have a guitar I am doing music in my head. Guitar music is my happy, I am a guitar addict. I do take a break in my free time take my dog for a hike or head for the gym. It is funny though even then the wheels are turning in my head and start thinking about the next riff. I get a melody idea, a new riff. I dream songs I wake up and try to write about it music is my life and there is so much more life to experience. JJN: Woodstock, would be awesome so much bang for your buck. I would take my girlfriend and dad what an experience it would be. 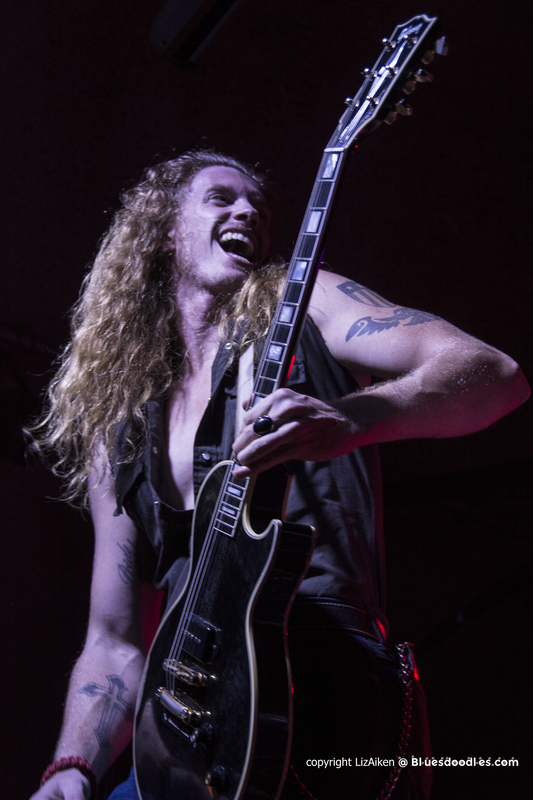 Jared James Nichols tours the UK with L.A. Guns from Friday 31st August.